So, this week Sarah Palin will be talking about how the pain at the pump is the fault of Big Government, and how it’s up to Big Government to make gas cheap for Real Americans. I’ll offer an alternative viewpoint: Americans don’t know how to drive or refuse to drive properly, won’t leave for work and appointments in time to get there without speeding, and refuse to take responsibility for their actions. It’s also disingenuous to reject current energy policy and then claim there’s no policy, but I digress. 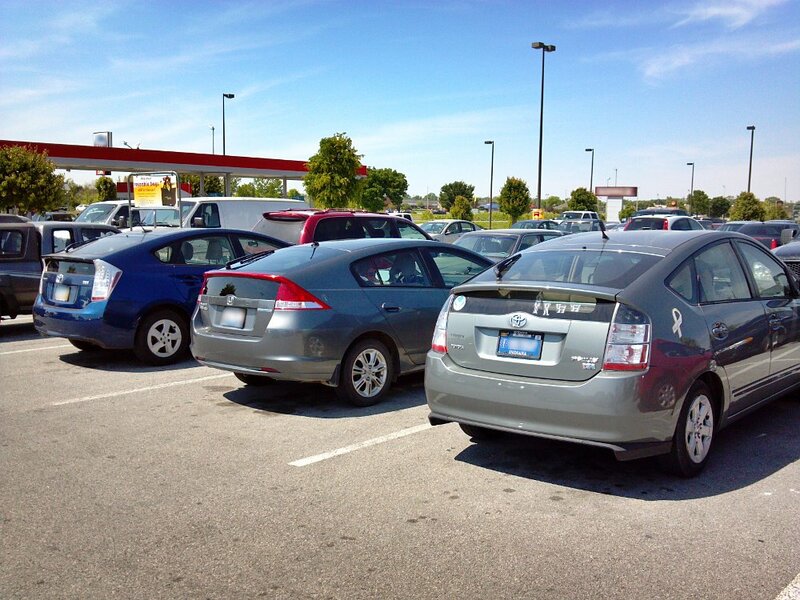 There was a recent Polk survey which found that only 35% of hybrid owners are buying hybrids again, despite high gas prices. Part of it is that auto manufacturers ahve wised up and are offering non-hybrid, fuel-efficient vehicles, but part of it is that people bought the things thinking they would be a magic bullet. How could I possibly know that? I’ve talked to disgruntled owners. I’ve seen what people are saying when they sue Honda and Toyota. I watch Priuses fly by my little Insight, and I shake my head. The thing about hybrids is that you can’t floor the accelerator at the green lights, slam on the brakes at the red lights, and expect to get great mileage. Another thing people bring up is price. You can get a base 2012 Accord for $16,700 for an automatic transmission, while a 2012 Insight will set you back $18,500 with a CVT. Well, my goodness, right there you’re spending nearly an extra $2000, right? Well, how about fuel cost? Unfortunately, if gas prices are an average of $2/gallon over the life of the car, the naysayers are right. You’d have to drive the car for 10 years to break even, assuming you get average mileage based on EPA ratings. However, if you drive the Insight correctly, you’ll be getting 5-10mpg over the EPA ratings, and you’ll break even earlier. After 28 months, my 2010 Insight has averaged around 44 mpg and about 44,000 miles. Assuming that trend continues, and assuming average gas prices around $4, I’ll break even in another three years, and will likely have the car for another three beyond that. Besides, with more hybrids on the road, the cost of ownership is going down, so the hybrid premium is dropping. And within a few months, there will be more plug-in hybrids on the road, and even production pure electrics on the road. Some people like to harp on batterly life. I mean, my goodness, you might have the car for 7-10 years, and the battery will go bad and might be more costly than the car is worth! What then? I don’t know about anyone else, but for me there’s no “there” there. Most my cars have had something go wrong after eight years that were more costly than the car was worth. Now, on to the tips. Keep in mind that most of these are practical, safe hypermiling tricks, and will work on nearly any car. However, with hybrids, they tend to be more beneficial. This is one of the most important tips, because most of the energy used in a car is during acceleration, and most is wasted during deceleration. I used to leave work at strange hours. I live in a semi-rural area, and had to go down a four-lane highway to get home at night. The highway has a few “smart” stoplights on it, but by and large, the lights are timed and timed properly. If I accelerated at a sensible rate, and kept my speed at speed limit, I could drive 16.5 miles without ever stopping. There are stoplights approximately every mile and a half between here and there. I literally watched a person one night take off from stop lights, get their speed up as fast as possible, slam on their brakes at every stoplight, and do the same thing over and over again, as I kept cruising down the road without stopping. Quick, what do you call a person who keeps doing something over and over again, the same way, and expects different results? What was that old saying about slow and steady? Depending on what hybrid you own, you’ll have some sort of meter that tells you how much gas you’re using during acceleration, and will probably tell you if you’re doing things in an inefficient manner. Use common sense here: if you’re in a congested, urban area, it’s not going to be safe to use the next 30 seconds to get up to highway speed. This is the hypermiling practice of keeping your foot as still as possible, and letting your speed rise and fall as you go uphill and downhill, rather than accelerating to go uphill. From personal experience, this can make a major impact; keeping the engine at a constant idle speed means it’s using very little energy. Again, use common sense; don’t let your speed drop below minimum speed limit or lower than other drivers will tolerate, and don’t let your car accelerate to the point that you’ll put yourself at risk of a traffic violation. This is great advice for all drivers. Friction can go a long way toward stopping the car. Again, use practical sense here; using the next five miles to slow down won’t endear you to other drivers. Even light braking is okay on most hybrids; try to save the heavy braking for emergencies. Depending on your hybrid’s system, it should be possible to tell when you’ve gone from regenerative braking to using friction brakes. It amazes me that in an age of $4 gasoline, people still don’t plan their trips, and still refuse to go on foot. I used to be nearly as guilty as anyone else, but at least I’ve never been guilty of getting in my car, pulling out of a driveway, and pulling into the next door neighbor’s driveway just to go have a chat. If you do that, I don’t want to hear any complaining about gas prices from you. Just by limiting grocery store trips to when I need to do something else, like, say, go to work or pick up a child from school, I drastically cut the gasoline bill.